James Jewell, Master Carver of the Lummi Nation’s House of Tears Carvers. That is the question posed by Jewell James, Master Carver of the Lummi Nation’s House of Tears Carvers, of the numerous coal port projects around the northwest and beyond. 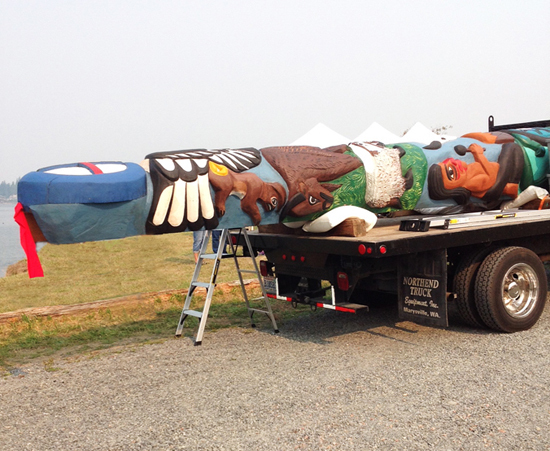 For the third year in a row, Lummi carvers have hand-carved a totem pole that will journey hundreds of miles, raising public awareness and opposition to the exporting of fossil fuels. And the timing couldn’t be more important, as the Army Corps of Engineers may be deciding by the end of this month whether or not it will agree with the Lummi Nation and deny permits for the Gateway Pacific Terminal Project at Cherry Point. 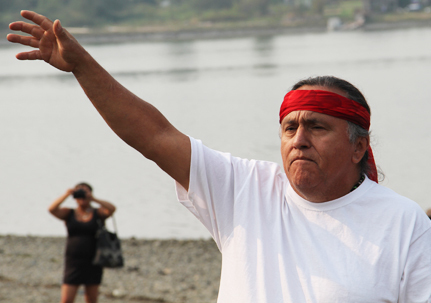 Lummi Nation, in fighting to block the terminal, cited its rights under a treaty with the United States to fish in its usual and accustomed areas, which include the waters around Cherry Point. This year’s journey, aptly named ‘Our Shared Responsibilities’ began August 21 in Bellingham, the location of the proposed Cherry Point terminal. The pole then traveled through British Columbia, Tulalip, Portland, and Celilo Falls on the Washington/Oregon border, and then on to Yakama, in opposition with the Yakama Nation of the Port of Morrow export project. The journey continues to Spokane, where the Spokane and Blackfeet tribe will unite in their opposition to accelerated hydrological fracking and oil leasing in the northern range of the Rocky Mountains. The journey’s final destination, scheduled for August 28, will be Lame Deer, Montana, to support the Northern Cheyenne, whose sacred lands would be devastated by a proposed coalmine. Lump carvers hand-carved this totem pole to raise public awareness and opposition to the exporting of fossil fuels. 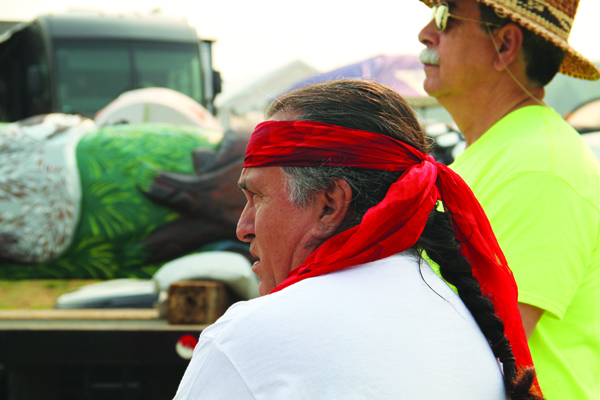 On August 23, the Tulalip Tribes welcomed the totem pole and guests with songs and blessings. Tribal Chairman Mel Sheldon opened the ceremony and tribal member Caroline Moses led a blessing song for the totem pole. 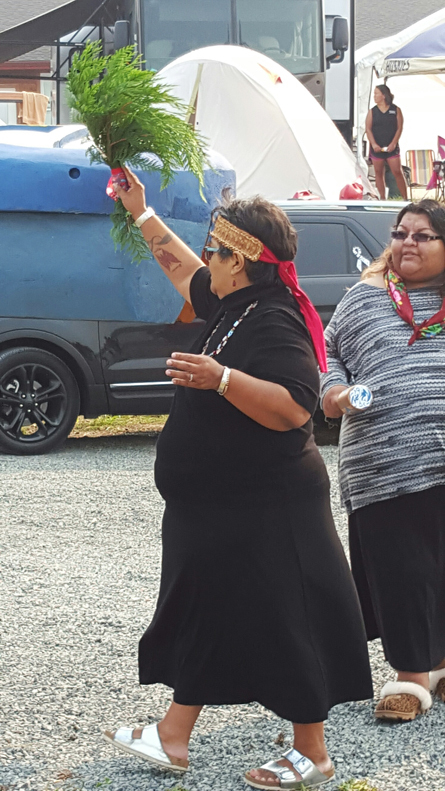 Tulalip tribal member Carolyn Moses blesses the totem pole. James went on to speak about the united effort to defeat these fossil fuel export projects, saying that, “nobody hears us, because the media doesn’t come to Northern Cheyenne.” The totem pole journey plays an important role in bringing people together, creating new alliances, and empowering the public with information about fossil fuels and the damage they are causing the environment. “Pope Francis came out with a statement last year that they were wrong and they should have taught the people how to love the earth, not destroy it. They made a mistake. What we need to do as tribal people is to make sure that they live up to the words they put out publicly. We’re calling on everybody to join together. We need to get together because the Earth’s dying. July was the hottest recorded July in recorded history. The Earth is burning. Global warming is a reality and they’re syphoning our rivers dry. Our salmon, our fish, and everything else that depend upon it is dying around us. This entry was posted in Environment, Top Story and tagged environment, fossil fuels, Jewell James, Lummi, Lummi Nation’s House of Tears Carvers, totem pole, Tulalip Tribes by Kim Kalliber. Bookmark the permalink.